Tomorrow I will be hosting a BBQ for the annual conference of the Canadian Association of Slavists, and vodka will be served. 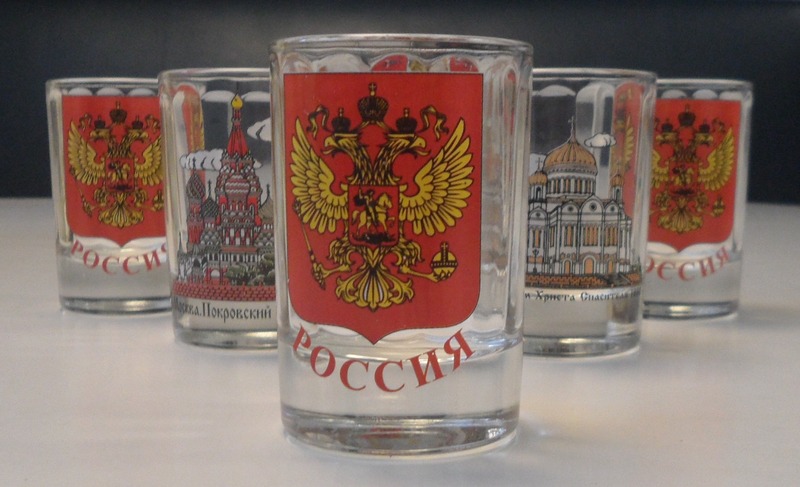 In light of this, today’s objects are some vodka glasses from Russia. Soccer is much on my mind this week. On Friday, my oldtimers team plays its season opener against the nearby town of Russell, and on Saturday I hope to be able to watch Arsenal face off against Aston Villa in the FA Cup Final. Victories for my team and for the Arsenal will make it a good weekend. The arrests have immediately sent conspiracy theorists into overdrive. The Moon of Alabama blog, for instance, links them to an upcoming vote in FIFA’s congress to suspend Israel’s membership because of accusations of discrimination against Palestinian players. The implication is that the United States is attempting to discredit FIFA prior to the vote and deflect attention away from the Israel issue. I don’t buy it. As the Russian Sports Minister has noted, the arrests are not actually linked to the World Cups in Russia and Qatar. Rather, the charges laid against the FIFA officials stretch back a quarter of a century and also include allegations concerning the 2010 World Cup in South Africa and the 2016 Copa America in the United States. Swiss authorities say that a separate investigation is underway to look at claims that Russia and Qatar won the rights to hold the cup finals in their countries by bribing FIFA officials, but that is a different issue. The vast sums of money involved in professional soccer have sadly corrupted the game at the highest level. That reality, far more than geopolitics, probably lies behind today’s arrests. Elena Maltseva (University of Windsor): ‘Lost and forgotten: The war through the eyes of the Donbass people’. Ivan Katchanowski (University of Ottawa): ‘The far right in Ukraine during the Euromaidan and beyond’. The panel should provoke an interesting discussion. Today’s object is a ‘cup of sorrows’. Its name derives from the tragic events which occurred this week 119 years ago, on Khodynka Field in Moscow on 18 May 1896. In expectation of free food and drink and souvenirs, including commemorative mugs, a crowd of about 500,000 assembled at the field to celebrate the forthcoming coronation of Tsar Nicholas II. Rumours that there was a shortage of freebies and that the mugs contained gold coins set off a stampede, which left over 1,000 Muscovites dead. In light of the disaster, the mugs acquired the title ‘cups of sorrows’. 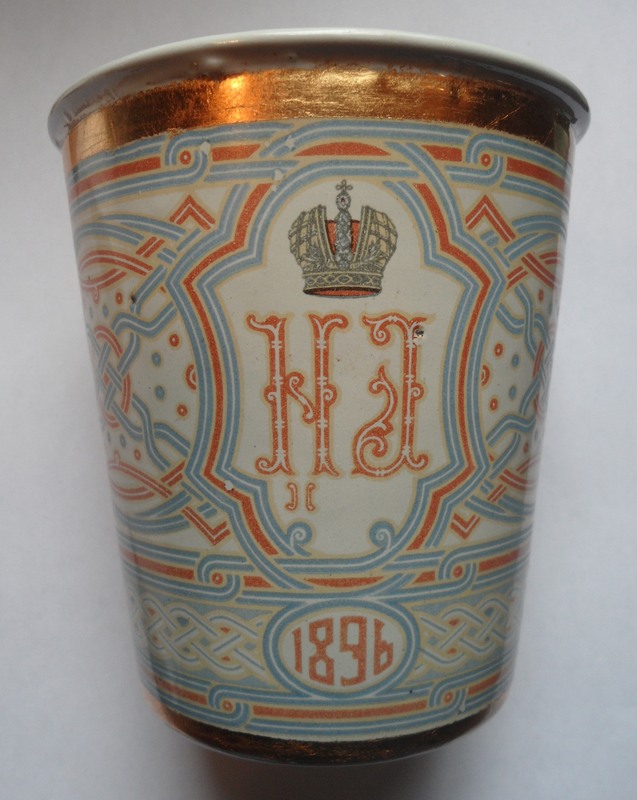 The letters ‘N’ and ‘A’ under the crown on the cup stand for Nicholas and Alexandra. ‘It is not our assessment that he [Putin] is bent on capturing or conquering all of Ukraine,’ said the American Director of National Intelligence, James Clapper, in March, ‘he wants a whole entity composed of the two oblasts (regions) in eastern Ukraine which would include a land bridge to Crimea.’ The ‘land bridge’ idea is a popular one among Western politicians and international affairs commentators. A March article in The New York Times, for instance, described such a bridge as one of Russia’s ‘key goals’. The thinking is that because Crimea is isolated from the rest of Russia, Moscow needs to establish overland communications with it by conquering Ukraine’s southern coast. This would involve not only capturing the city of Mariupol, but going beyond the boundaries of Donetsk Province, through Zaporozhe and into Kherson, an advance of around 300 kilometres. 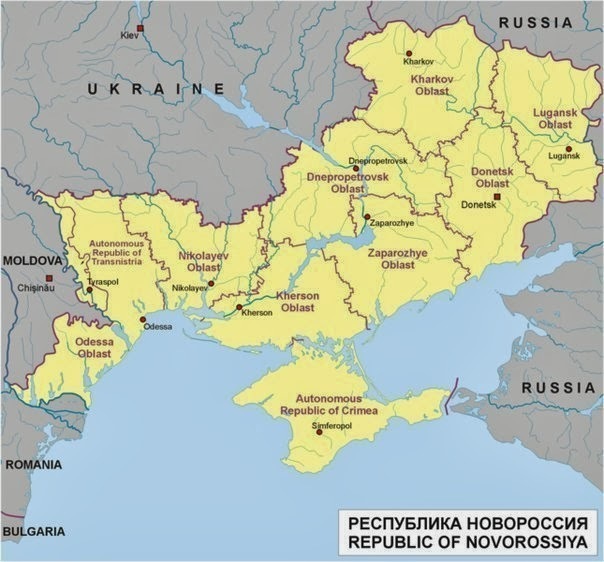 Closely associated with the land bridge concept is that of Novorossiia, a somewhat undefined entity which notionally includes all of the eight provinces of southern and eastern Ukraine. From Russia’s point of view, promoting the idea of Novorossiia has the advantage of providing ideological justification for further expansion to secure the alleged land bridge. In line with this, soon after the annexation of Crimea in March 2014 Ukrainian rebels demanded the creation of Novorossiia, invented symbols for it (including competing flags), and even set up institutions which were meant to represent it. Most prominent among the latter was the so-called Novorossia Parliament, chaired by Ukrainian politician Oleg Tsaryov. This Wednesday, however, Tsaryov declared the Novorossiia project ‘frozen’. ‘It isn’t foreseen by the Minsk agreements’, Tsaryov said, ‘and we don’t want to be blamed for disrupting them’. The ‘parliament’ was no longer meeting, he added. From a practical standpoint, this announcement is not very significant. Just one of several competing institutions formed in spring 2014, the self-elected Novorossiia parliament soon lost ground to the Donetsk and Lugansk People’s Republics (DPR & LPR), which became the true locus of loyalty and authority in rebel controlled areas and which eventually acquired some form of legitimacy through the elections held in November 2014. Over time the DPR and LPR have gradually created the basic structures of real states, while Novorossiia has remained moribund. Tsaryov’s declaration is no more than an acknowledgement of reality. Still, from a political point of view this acknowledgement does have real meaning. Tsaryov is a Ukrainian, not a Russian, and it would be a mistake to describe him as a simple puppet of the Kremlin. Nevertheless, had his project had strong backing in Moscow (whether financial or even purely moral), it is unlikely that it would have stalled so completely. Tsaryov’s statement is proof that the Kremlin does not support the creation of Novorossiia, but instead backs the provisions of the Minsk agreement which envision Donbass remaining within Ukraine, albeit under an amended constitution. What, then, does this mean for the land bridge? The answer is simple. Not for the first time Mr Clapper and American intelligence have it wrong: Russia doesn’t want it, and isn’t doing anything in order to get it. Work began this week on the construction of a real bridge linking Crimea with Russia across the Kerch Strait. Russia, it seems, will be content with that. My review of Richard Sakwa’s book Frontline Ukraine: Crisis in the Borderlands has been published by E-International Relations. You can read the review here. 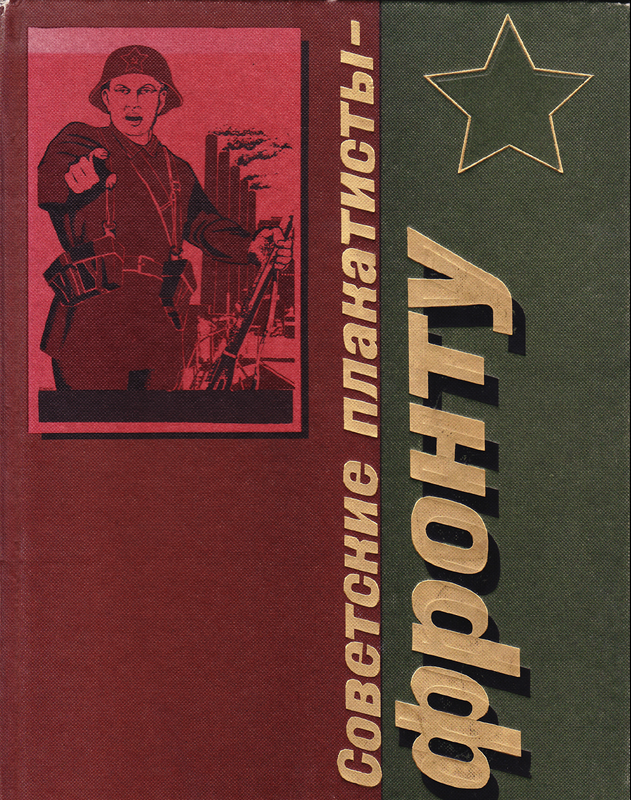 Continuing last week’s military theme, this week’s object is a book entitled Soviet poster artists to the front! 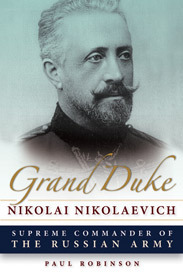 which was published in Moscow in 1985. 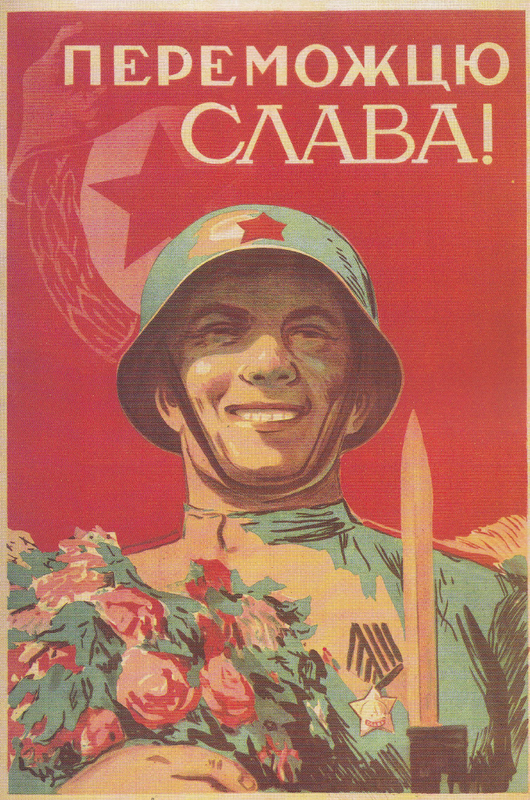 Among the 120 posters shown in the book is this one, originally produced in Kiev in 1945. ‘Glory to the Victor’, it says in Ukrainian.